Breckenridge Sleigh Rides offer the perfect opportunity to spend an evening away from the bustle of town amidst the serenity of the Rocky Mountains. Listen to the ringing of the animals’ bells and the crunch of fresh snow beneath their feet as you’re delivered to the warmth of a lodge’s fire and a delicious meal or a frothy hot chocolate. 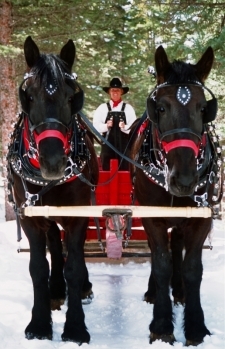 Breckenridge Sleigh Rides are an ideal activity for couples‚ families or groups and are sure to be a memorable experience for everyone. This is an activity all members of your party can participate in, regardless of age or physical ability and is one of our most requested activities in Beckenridge. We work with the premier Breckenridge Sleigh Ride Outfitters at their prices, making our booking services free of charge to you. To book your Dinner or Scenic Sleigh Ride in Breckenridge, call Summit Vacation Concierge toll free at 1.866.998.0696 or locally at 970.455.4040. Summit Vacation Concierge works with Breckenridge's premier Sleigh Ride outfitters at their prices, making our bookings services free of charge to you!